If you haven’t paddled the Crystal in a few years or never navigated the lakes leading to the headwaters, you now have every reason to reintroduce yourself. With the added miles of some pleasant lake paddling, coupled with the removal of the Little Hope millpond dam, there’s just more to love about the Crystal. This is a very recommendable level. Time: Put in at 1:40. Out at 4:25. Wildlife: Deer, geese, turtles and hawks. It’s no secret that I normally end my paddling season in Waupaca (for no real reason, it’s just become a personal tradition, I guess) but this year, I decided to start in the area where I finished in 2014 and experience the water before the crowds and weeds of the Little Hope Millpond took over on the Crystal River. This was before I knew that the Millpond didn’t even exist anymore – more on that later. Here’s the shorthand for this extended Crystal River trip. Put-In > Blue Marl Lake > channel > Pope Lake > channel > Manomin Lake > channel > Knight Lake > Lake Orlando > Beasly Creek > Beasly Lake > Long lake > Crystal River headwaters > Ding’s Dock mandatory portage > Crystal river > Junction Lake > Crystal River > Class I drop > Crystal River > (former) Little Hope Millpond (now returning to it’s natural state) > Class II drop through former dam > Crystal river > Covered bridge > Crystal River > take-out. That’s a lot of personality for an 8.5 mile trip. We often talk about how one week can make a difference for a paddle. Rivers and creeks are, after all, living, moving and changing beings. Well, what a difference four years has made to the Crystal. I first paddled it back in 2011 and at that time, I said I’d probably add the lakes section to extend an already short paddle and to see what the headwaters of the Crystal offer. It was a wise choice. It didn’t disappoint and it makes for a very fulfilling journey. That said, while I often refer beginners to the Crystal because it’s usually obstruction-free, shallow, pretty and just darn fun, the additional lakes section may prove a little taxing (especially if it’s windy). Therefore, putting-in at Rural or taking-out at the park in Little Hope next to the Red Mill may be advisable for a shorter day trip. The put-in at Marl Lake is welcoming and pretty. There are many a “No Parking” sign surrounding the entrance off Whispering Pines Road which certainly give the impression there’s no parking, but you can actually park on the right side of the path leading down to the launch. Fun fact du jour indeed, my friend. Almost immediately upon leaving the Marl Lake boundaries, the water turns clear, losing its cerulean cast but the water continues to mesmerize as its transparency allows you to see practically everything on the lake-bottom. You’ll continue to navigate through corridors of lakes and short channels. Midway through, you’ll come upon Beasly Creek, a short jaunt, hardly worthy of its own designation as a creek. I was able to get through at this water level (this was high – only based on the Waupaca gage) but I really can’t imagine this being paddleable in anything lower. I was only floating on a couple of inches of water as it were. Regardless, it would be a short and pleasant hike (especially if it were hot out) with kayak entow to Beasley Lake. The last stretch of lake paddling is on the aptly named Long Lake – and trust me, it really is dam long. If you have a headwind, this will be a workout. I had gotten lucky on this day. Then to the headwaters of the Crystal – which is instantly familiar – you kind of know when you’re on it because it’s so characteristically its own. Dotted with the occasional boulder, there are fun riffles and easy beginner drops all the way to the mandatory Ding’s Dock portage, river-left, in the charming little town of Rural. Rural really is adorbs and paddling through manicured landscapes surrounding manicured homes is always an entertaining venture (I should note that people in this area seem to have a sense of humor with clever signs like “Warning: Bigfoot Area – Stay on Marked Trails” or by having a mailbox installed at the edge of the water facing the creek – next time I’ll leave Miles Paddled sticker). Then through the marshy Junction Lake where geese were plentiful and nesting (it is that time of the year I suppose). Soon, you’ll come upon the Class I drop before the Rural Road bridge. It’s fun and splashy and used to be the highlight but that has now been one-upped (again… more on that soon…). There’s a little more creek before coming upon what was the Little Hope Millpond (and quite frankly, from my previous paddle, the section I was dreading). But before starting this journey, I, by habit, scouted again and what took me by great surprise was… there was no longer a lake/millpond! I visited the nice folks at the Red Mill gift shop to get some insight as to where the pond went (as well as my curiosity surrounding the reality of running the opening in the dam). It turns out, the DNR removed the dam a couple years ago. It was just too expensive to maintain. This was all news to me. (In fact, just about a week before I paddled this, a Waupaca County judge had ruled that the dam can and should be removed in its entirety). So now the river is finding its way back to its natural flow. It’s a definite work in progress and I can imagine it will look a little different the next time I paddle it. For now, these are prime nesting grounds for geese (there must have been a hundred of them). I (and we) love the idea of once again, allowing a river to be reborn back to its original free-flowing state but I couldn’t help but feel for the homeowners, especially on the north side who have lost their lake access. It was an eerie sight to paddle down the river which is just finding its newly-found legs while be flanked by docks jutting out in mid-air. And I couldn’t help but think of the memories that people once might have had of the millpond, whether it was jumping off those docks on a hot afternoon or casting for some panfish in the evening. With the dam open, there is no mandatory portage – it is runnable (well, until it’s eventually removed, that is). In fact, I asked a fellow paddler that I’d passed on my way about it being runnable. She said, “absolutely! But be prepared for some duck splash!” Well, I wasn’t completely sure what that meant (but I played it off like I did) and ran it. It was then I learned that apparently, “duck splash” means “lap full of water” because I took it on like the Titanic. It was a lot of fun but there is a lot of force on that drop and with that force, comes a lot of water behind it. For beginners, (even at these water levels) it should be a relatively safe drop since it appears shallow enough, where, worst case scenario, one would only need to stand up if the drop got the best of you. After the dam, you’ll paddle around a park located next to the Red Mill off Highway K (which is a convenient and popular take-out/access point but I still contend that the last stretch is worth paddling). 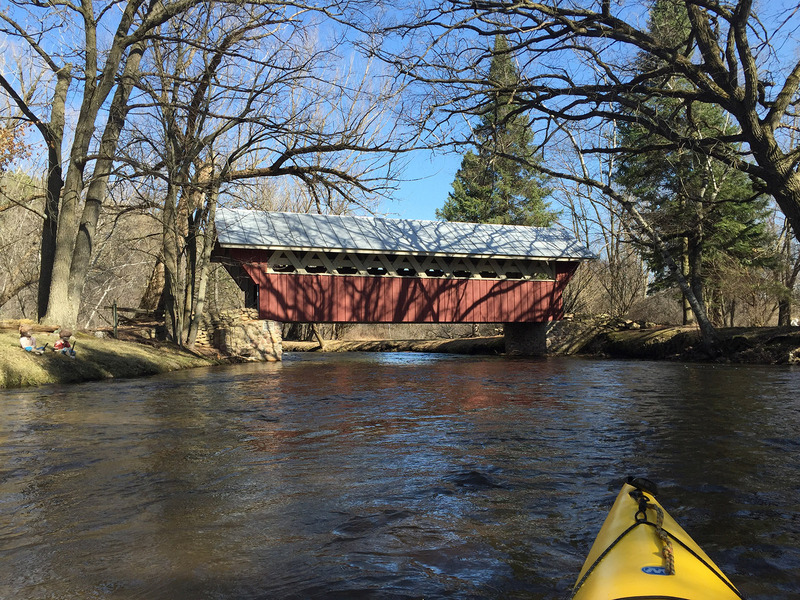 Just behind the Red Mill you’ll paddle under the beautiful covered bridge near the wedding chapel. From there, the Crystal continues to be crystal clear but with less riffles. You’ll encounter a tricky strainer/downed tree just before the firing range (no shots being fired on this day, thankfully) and then a short windy stretch to the take-out. The take-out on Shadow Lake Road is a bridge-side take-out. Nothing special. For only being the second time I’ve been here, I’m 2 for 2 in the dead-animal-by-the-take-out department. 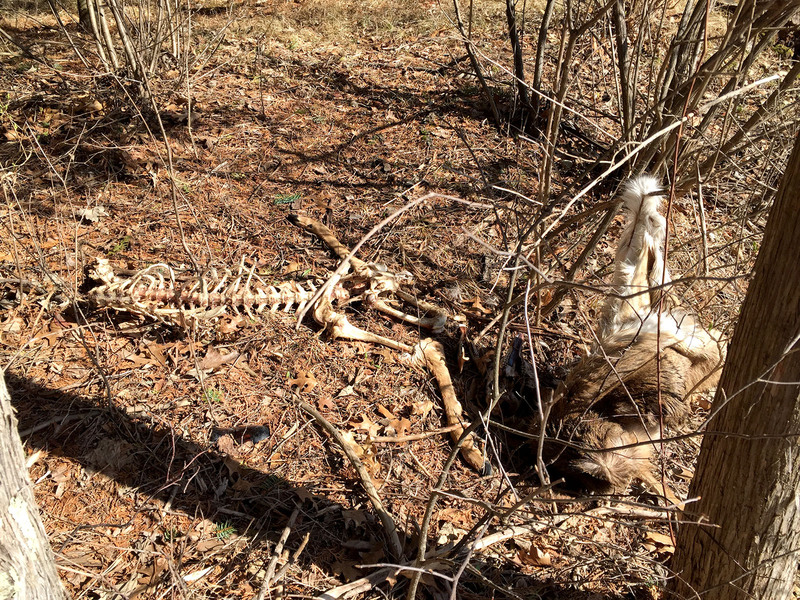 I seem to have some sort of “carcass luck” (last time, I think it was a raccoon but this time, a deer, I do believe). Absolutely nothing. The Crystal is a gem that just got more interesting and varied. The popular section of the Crystal is from Rural to Shadow Lake Road but a 4.75-mile trip has always felt too short, often leaving you longing for more. I strongly recommend making the most of your afternoon by adding the lake section to experience the headwaters. And now, with the reintroduction of the Little Hope Millpond-turned river once again, you have all the more reason to revisit this special river. And it will, no doubt, continue to be an increasingly popular destination for beginner paddlers who enjoy a bit of excitement and variety in their paddle, especially us. By bike, the shuttle is generally easy. Not a whole lot of strain until just past Highway 22 where you’ll encounter some hills on the Rustic Road leading to the put-in on Marl Lake. But all in all, a great workout. The put-in at Marl Lake. Knight Lane bridge. There is a great landing river-left (but you’d miss paddling Marl Lake). The clear waters of Lake (Tony) Orlando. The shallows of Beasley Creek. Greeting you at the entrance to the headwaters of the Crystal. Shortly after Highway 22, you’ll find signs guiding you river-left under the Main Street bridge to the Ding’s Dong portage. The portage/put-in off Main is easily accessed. One of a few Rural Road bridges. Rural Road bridge, yet again. The fun little drop little to the Rural Road bridge. Another fun little drop around a manicured backyard. The beginning of a river once again (former Little Hope Millpond). Evidence of how high the millpond once was. The covered bridge behind the Red Mill.